Fed up with the fact that she has to spend “a small fortune” in order to feed her family things she says “aren’t poisonous,” Tami Canal of Utah has organized a global movement against the giant chemical and seed corporation Monsanto. Monsanto is the conglomerate mastermind behind many of the pesticides and genetically engineered seeds that pervade farm fields around the world. Monsanto produces the world’s top-selling herbicide; 40 percent of US crops contain its genes; it spends millions lobbying the government each year; and several of its factories are now toxic Superfund sites. Canal, who has a 17-month-old baby and a six-year-old girl, cites concerns over public health, adverse affects on the environment, and political corruption as her motivation to organize against the biotech giant. And her concern has resonated. Protesters around the world have responded to Canal’s call to action, and will amplify their dissatisfaction with the corporation in a “March Against Monsanto” on May 25. What started as one mother’s call to action on a Facebook page has become a movement with more than 400 demonstrations scheduled in 50 countries and 250 cities around the globe. The events are organized online via an open Google Document, where people can find the protest nearest them. The March Against Monsanto Facebook page has received more than 105,000 “likes.” It has reached more than 10,000,000 people in the last week according to its website, which averages over 40,000 visitors per day. One of the short-term goals of the march, Canal says, is to spread immediate awareness about the offenses Monsanto commits. Another is to inspire people to vote with their dollars by boycotting Monsanto-owned companies that put unsafe products—like genetically modified organisms (GMO) and pesticide-ridden foods—on the market. The effort also advocates for labeling of genetically modified products so consumers can make informed decisions, and demands further scientific research on the health effects of GMOs. The ultimate goal of the march is a complete ban on Monsanto within the US. At least 60 countries worldwide, including Austria, Bulgaria, Germany, Greece, Hungary, Ireland, Japan, New Zealand, Peru, South Australia, Russia, France, and Switzerland, have implemented outright bans of Monsanto and its genetic modification of food products. 1. Profiteering poisonous chemical company posing as agribusiness. Remember the horrors of Operation Ranch Hand during the Vietnam War, when the US military designed a chemical warfare program and used the herbicide and defoliant Agent Orange to kill and maim 400,000 people (estimated by the Vietnam government), and ultimately cause birth defects for 500,000 children? Monsanto made that possible. Monsanto began as a chemical company in 1901 and was responsible for some of the most damaging toxins in US history, like polychlorinated biphenyls (PCB’s), and dioxin. Consumer advocacy group Food and Water Watch (FWW) released a report on APril 3 detailing Monsanto’s role in chemical disasters, Agent Orange, and the first genetically modified plant cell. The report shows that the “feed-the-world” agricultural and life sciences company Monsanto markets itself as today is only a recent development. The majority of Monsanto’s history is involved with heavy industrial chemical production, including the supply of Agent Orange to the US for Vietnam operations from 1962-’71. Despite its various marketing incarnations over the years, Monsanto is a chemical company that got its start selling saccharin to Coca-Cola, then Agent Orange to the U.S. military, and in recent years, seeds genetically engineered to contain and withstand massive amounts of Monsanto herbicides and pesticides. Monsanto has become synonymous with the corporatization and industrialization of our food supply. Another example, according to the FWW corporate profile, is a Monsanto plant in Sauget, Illinois that produced 99 percent of PCBs until they were banned in 1976. PCBs are carcinogenic and harmful to multiple organs and systems, but they’re still illegally dumped into waterways. They accumulate in plants and food crops, as well as fish and other aquatic lifeforms, which enter the human food supply. The Sauget plant is now home to two Superfund sites. Monsanto’s chemicals continue to impact the world, both inside and outside of the United States, and Monsanto has settled a number of chemical lawsuits in the last couple of years alone. Scientific studies have linked the chemicals in Monsanto’s Roundup pesticides to Parkinson’s disease, Alzheimers disease, autism and cancer. Another example of Monsanto’s chemical folly came in February when a French court declared Monsanto guilty of chemical poisoning of French grain grower, Paul Francois. The farmer suffered neurological problems including memory loss, headaches and stammering after inhaling Monsanto’s Lasso weedkiller in 2004, and blames the agri-business giant for not providing adequate warnings on the product label. AlterNet published an article in April titled, “Exposed: Monsanto’s Chemical War Against Indigenous Hawaiians,” which details a series of protests on the five Hawaiian Islands Monsanto and other biotech companies have turned into the world’s “ground zero” for chemical testing and food engineering. 2. Building a monopoly, putting farmers out of work. There is nothing more quintessentially American than the independent family farmer; and there is nothing more un-American than stomping out that farmer’s livelihood to bolster your corporate monopoly. Monsanto is attempting this as it sues small farmers out of their livelihoods time and again. You might have heard about the 75-year-old soybean farmer from Indiana, Vernon Hugh Bowman, who was ordered in the beginning of May to pay Monsanto $85,000 in damages for using second-generation seeds genetically modified with Monsanto’s pesticide resistant “Roundup Ready,” treatment. He pulled the seeds from the local grain elevator, which is usually used for feed crop, and planted them. The court decided Monsanto’s patent extends even to the offspring of its seeds, and the farmer had violated the company’s patent. Bowman is by no means the only US farmer to be sent into debt at Monsanto’s hands. Monsanto reported enormous profits from 2012 to shareholders in January, while American farmers filed into Washington, DC to challenge the corporation’s right to sue farmers whose fields have become contaminated with Monsanto’s seeds. Oral arguments began on January 10 before the U.S. Court of Appeals to decide whether to reverse the cases’ dismissal last February. The corporation’s total revenue reached $2.94 billion at the end of 2012, and its earnings nearly doubled analysts’ projections. In the article, “Monsanto’s Earnings Nearly Double as They Create a Farming Monopoly”—originally published in Al Jazeera and reprinted on AlterNet on January 16—Charlotte Silver outlines how Monsanto has increased the price of the Roundup herbicide and exploiting its patent on transgenic corn, soybean and cotton, to gain control over those agricultural industries in the US, “…effectively squeezing out conventional farmers (those using non-transgenic seeds) and eliminating their capacity to viably participate and compete on the market.” The company also uses its power to coerce seed dealers out of stocking many of its competitor products. Monsanto was under investigation by the Department of Justice for violating anti-trust laws by practicing anticompetitive activities towards other biotech companies until the end of 2012. The investigation was quietly closed before the end of last year. Monsanto exerts vast control over the seed industry. It started buying out seed companies as early as 1982. Some of Monsanto’s most significant purchases were Asgrow (soybeans), Delta and Pine Land (cotton), DeKalb (corn), Seminis (vegetables) and Holden’s Foundation Seeds (in 1997). Monsanto is unmatched in its tactics for squashing its competition, but the US has not put its antitrust laws into practice to clamp down on the corporate monopoly it’s forming. 3. Controlling the food, privatizing the water. Half of the Earth’s population will live in an area with significant water stress by 2030, according to estimates from the Organization for Economic Cooperation & Development. Corporations like Monsanto (along with Royal Dutch Shell and Nestle) are vying for a future in which free water supply is a thing of the past, and private companies control public water sources. According to a government report titled “Intelligence Community Assessment; Global Water Security,” by 2025, the world’s population will likely exceed 8 billion people, and the demand for water will be 40 percent higher than sustainable water supplies available, with water needs of around 6,900 billion cubic meters due to population growth. Private corporations already own 5 percent of the world’s fresh water. Billionaires and companies, including Monsanto, are purchasing the rights to groundwater and aquifers. In an even more ominous twist, Monsanto is accused of dumping its plethora of toxic chemicals, including PCBs, dioxin and glyophosate (Roundup) into the water supply of various nations worldwide. Then, seeing a profitable market niche, it has begun privatizing those water sources it polluted, filtering the water, and selling it back to the public. 4. Running the FDA, writing its own protection laws. As Tami Canal points out, studies have linked Monsanto and other biotech conglomerates to the decline of bee colonies in the US and abroad. Their environmental blunders don’t stop there. In 2002 the Washington Postpublished a piece titled “Monsanto Hid Decades of Pollution,” outlining the corporation’s pollution of an Alabama town with toxic PCBs for decades without disclosure. While Monsanto advertises its technology as important to achieving such goals as adequate global food production and “reducing agriculture’s negative impacts on the environment,” the UCS says in reality, the corporate giant stands in the way of sustainable agriculture. For one, Monsanto’s policies promote pesticide resistance. “Their RoundupReady and Bt technologies lead to resistant weeds and insects that can make farming harder and reduce sustainability,” reads the UCS article. The article also notes that Monsanto’s policies increase herbicide use, which can cause health effects, and perpetuates gene contamination, as engineered genes tend to show up in non-GE crops. Additionally, the UCS says Monsanto is a purveyor of monoculture because it focuses only on limited varieties of a few commodity crops, reducing biodiversity, and as a result, increasing pesticide and fertilizer pollution. The union points out that Monsanto’s lobbying, advertising and stronghold over research on its products makes it difficult for farmers and policymakers to make informed decisions about more sustainable agriculture. Finally, UCS says Monsanto contributes little to helping the world feed itself, and has failed to endorse science-backed solutions that don’t give its products a central role. 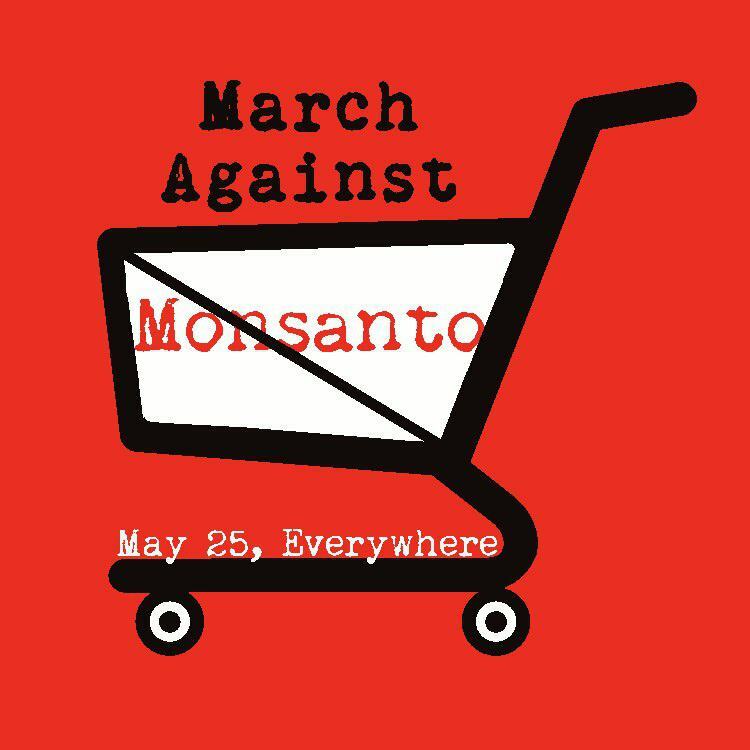 The San Diego March Against Monsanto will take place at 11 a.m. in Balboa Park. Protesters will meet at the fountain before marching. For the complete schedule and other information, click here. They may be above the law, but they are not above God. Pray hard and often for justice, Its really our only hope. The good news is, Prayer does work . If God hear the request from thousand, or millions of people, I am sure he will take swift action. How do you, Luke, know that god is a male? What if god is a woman? In fact, Shell Chemical Company was probably the largest manufacturer of Agent Orange at its secret operation at Rocky Mountain Arsenal.